A circlet of ivy crowns the green awning of Garibaldi’s Greene St. entrance. Valet boys take a break from bragging about their tips and joustle for position as a car approaches, hoping to gain the favor of the next customer. One gives up as a street light reveals the profile of an approaching Ford Fiesta. Silently he lights a cigarette and mournfully mutters something about “customer profiling” and “student loans.” An artful depiction of the noble flounder, a classic low country favorite, hovers overhead, bringing the restaurants facade to life…. ….Since 1986, Garibaldi’s has been delighting Columbia, SC restaurant lovers with its signature “Crispy Flounder” and classic Italian offerings. Keep it cheap, classy, and bacon flavored with the Fetticuine Carbonara ($9.95). Get a little tongue tied and ask your waiter (or waitress!) for the Veal Scalopinne Saltimbocca ($17.95). Trying to treat yourself? Crispy Flounder ($26.95) it is. Picture a whole fried flounder, diamond scored and drizzled with an apricot shallot sauce. Wow. The Veal Scalopinne Saltimbocca. 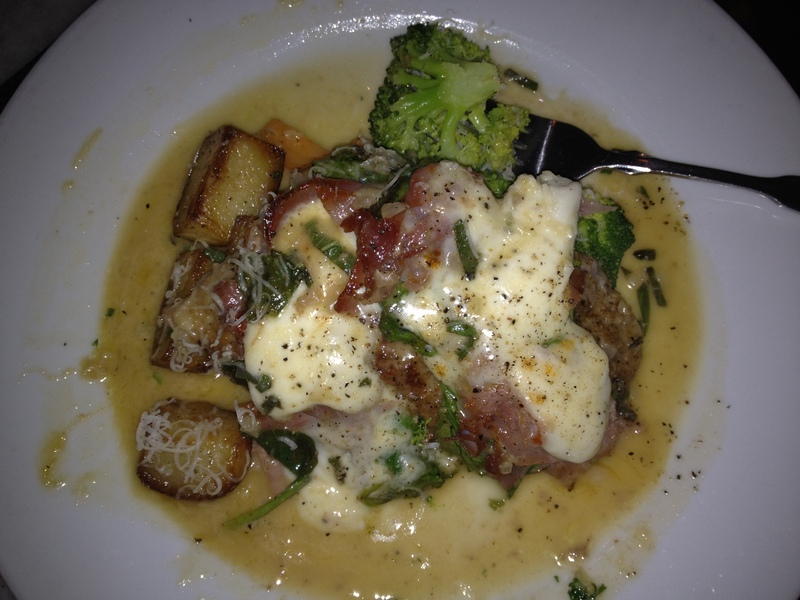 A generous slice of tender veal, topped with prosciutto, spinach and an avalanche of mozzarella, flanked by herb roasted red potatoes and steamed broccoli. This delicious island of culinary excellence was surrounded by a succellent lake of white wine sage sauce. 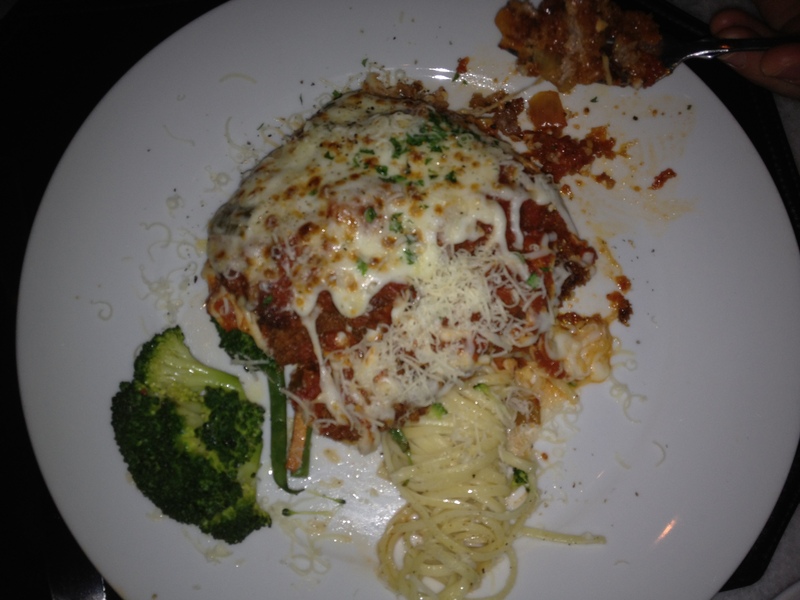 Veal Parmigiana. Quite satisfying, but I’m not so sure veal can replace chicken in this classic “American-Italian” dish. As I carved into the veal, I found myself craving the familiar fowl tucked under a thick blanket of marinara and mozzarella. Nonetheless, the dish was pleasing and packed with flavor. Hiding under the parmigiana crusted veal was a serving of sauteed green beans. A pleasant find and worthy compliment to the entrée. Satisfying and delicious meal. Pleasant atmosphere. Slightly awkward waiter. Enjoyable night out. Garibaldi’s offers a candle-lit dining atmosphere at whatever price you choose. With entrees ranging from $8.95 to $29.95, you can enjoy a nice night out without breaking a sweat or live it up “Filet Mignon” style. Looking for a Fine Dining Columbia, SC Restaurant or Romantic Columbia, SC Restaurant? You found one.